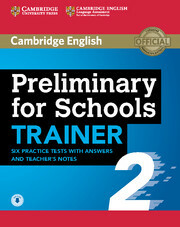 Preliminary for Schools Trainer 2 with answers and Teacher's Notes with Audio is the perfect companion for Cambridge English: Preliminary for Schools. The first two tests are fully guided with tips and advice on how to tackle each paper. Extra practice activities, informed by a bank of real candidates' exam papers, focus on areas where students typically need most help. Answer key with clear explanations and teacher's notes provides ideas for setting up and extending tasks, and sample answers for the Writing paper. The audio is downloadable from the website: cambridge.org/preliminaryforschoolstrainer2. A 'without answers' edition is available separately. 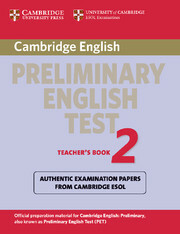 Accompanies a collection of four authentic past papers for PET, supplied by Cambridge ESOL.